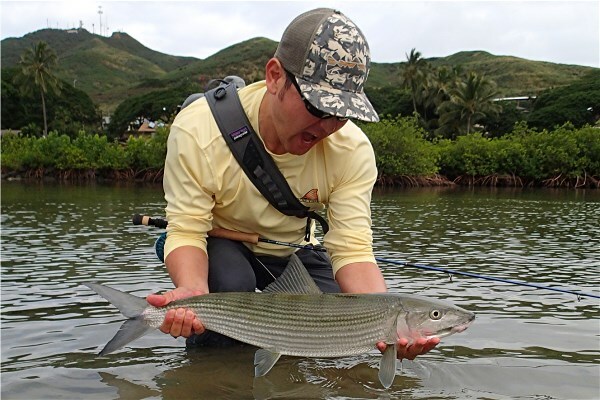 A question I get all the time is, "Is there a season for bonefish in Hawaii?" 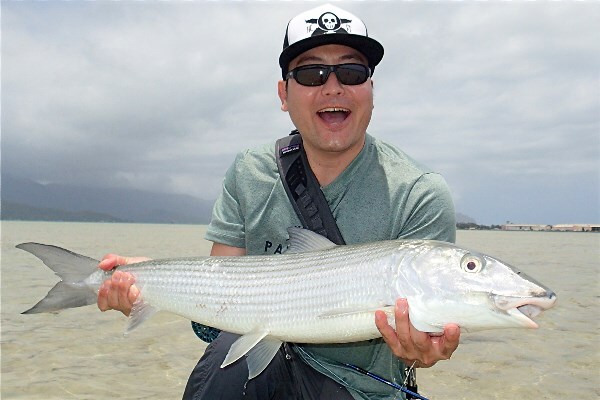 The short answer is no, we catch bonefish all year round, it�s just the weather that varies with the time of year. 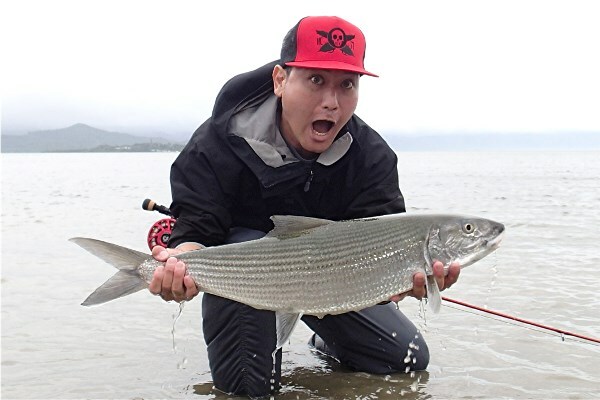 So there you have it, there is no "bonefish season" here, but let�s explore a little further into what happens as the months on the fishing calendar pass on by. Winter fishing is upon us now. 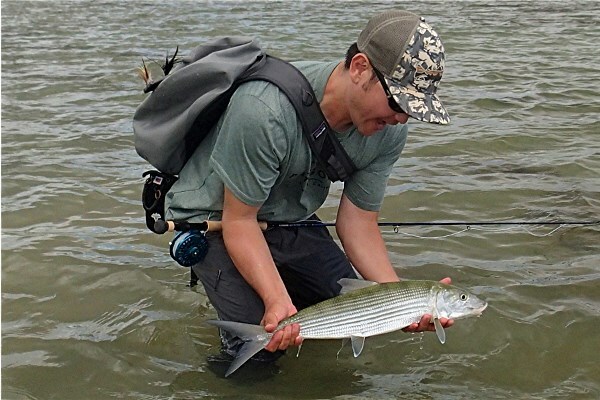 It�s the toughest time to get a bonefish on the flats. It�s not impossible, I caught this one just the other day, but it�s a lot more challenging. Here�s why: the water gets cold. I know for most of you the idea of 70 degree water sounds warm and inviting, but remember that bonefish are tropical fish and the deep water in the tropics never gets much cooler than 75 degrees. It�s a small difference, but it affects the bonefish�s metabolism and attitude. All the little fish that were hanging around in the summer months disappear and the only fish still willing to feed will be larger and less aggressive. So if you�re not seeing fish up shallow, remember that if they�re not there, they must be somewhere else. The deeper water is still a comfortable 75 degrees. Blind casting into deeper pockets and cuts in the reef is often the most productive way to fish when it gets chilly. Lob some heavy lead eyed flies into a likely looking spot, bounce the fly on the bottom, and remember to let go of the line when you get a bite. You can still sight fish if you�re stubborn like me, but realize there will be glare all day long and spotting the few fish around will be tricky. If we hit a stretch of sunny weather with warm south winds the fishing can improve dramatically, but trying to predict that is like trying to win at roulette. As the calendar moves into spring, the daytime tide swings start getting bigger and the water begins to warm up. The weather can still be cloudy, cool, and rainy, which again puts a damper on sight fishing, but overall the picture should be improving as far as numbers of fish on the shallow flats go. The light is getting better, but it�ll still be a few more weeks before the sun moves directly overhead. 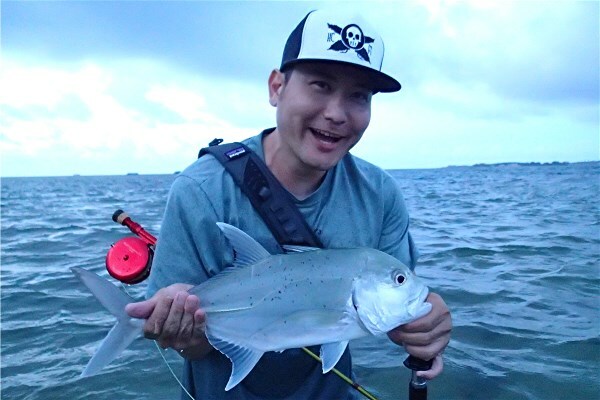 This is also the time I start getting excited about papio fishing again, as they too start showing up along the reef edges hunting for baitfish. When we reach May it�s usually warm and the sunshine is abundant. Tradewinds are the norm and the weather is consistent. 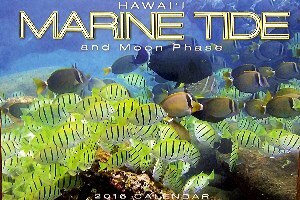 This is the happiest time for fishing in Hawaii. 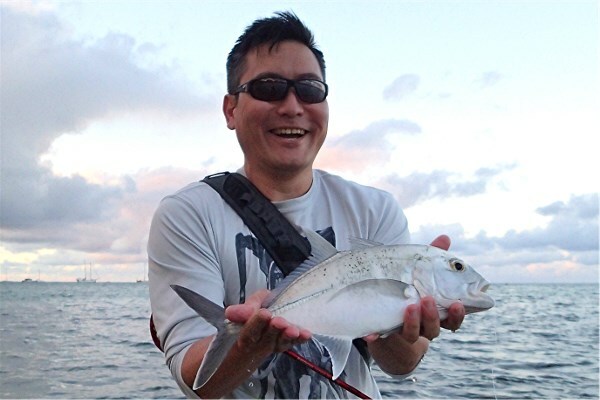 The bonefish and trevally inshore and tuna offshore should all be running in decent numbers. Fishing on Lake Wilson for peacock bass is great too. On the shallow flats the fish are feeding more heavily now and frequently large numbers of smaller fish will move in. These new recruits are much easier to hook than the older, wiser bones who have seen flies thrown at them for years. The sun will be directly overhead giving you the best light of the year. The only fly in the ointment is the big high tides in the middle of the day which limit skinny water fishing to the hours before and after the peak high tide. By the beginning of October the water is starting to cool off. The light, while not bad, is getting kicked out at more of an angle, which causes more glare. The numbers of small fish on the flats start to fade away. What remain are the big fishes, and they are still feeding heavily (perhaps loading up on high calorie foods, knowing that winter is ahead). This is the time for trophy hunters. Clay started calling them "fall fatties" a long time ago, and it�s still true today. If you want fewer shots on really big fish, the fall is probably the best time to attempt it. You really need to make the most of limited opportunities while sight fishing. This fish was caught last Thanksgiving, one of the biggest of the year, but I didn�t see many that day and this was the only fish I caught.